A fast-acting, broad-spectrum contact pesticide with no risk of resistance build up. PREV-AM has been proven as an effective control for a wide spectrum of insects, mites and fungi. This powerful contact pesticide can be used alone for quick knockdown or tank mixed with other pesticides as a part of your resistance management program. PREV-AM is the crop-friendly 3-in-1 pesticide that is ideal for use throughout the season for treatment of sudden outbreaks, population explosions and as a pre-harvest, clean-up spray. With PREV-AM there is no need for additional adjuvants due to the superior wetting and spreading characteristics that allow it to move into hard-to-reach areas and help prevent run-off. 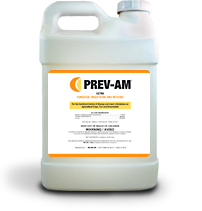 Either alone or mixed with other pesticides, PREV-AM delivers control you can count on. The versatile pesticide with three modes of action for superior results. Insects and mites are protected by a water repellent layer that loses its effectiveness when contacted by a PREV-AM application. This allows the active ingredient to penetrate and destroy the soft, living tissues underneath. The insects/mites are then exposed to the loss of body fluids, causing death. Flying insects experience loss of the protective coverings and tension in the wings, making them unable to fly. Additionally, water repellent hairs protecting the flexing points in insects lose their effectiveness, allowing PREV-AM to penetrate into their susceptible body parts, which are then destroyed. On some insects and mites the ultra low surface tension of PREV-AM allows an influx into the respiratory organs, causing internal suffocation. fly, and other insects with waxy wings, are very vulnerable to PREV-AM. After just a few minutes, a 0.4% application of PREV-AM has destroyed the wings of this whitefly. The PREV-AM solution wets the protective membranes of the superficial fungal mycelia (hyphae) and spores, allowing the active ingredient to penetrate and destroy the living tissues underneath. This exposes the organism to the drying effect of the atmosphere and causes collapse within 2 to 24 hours. Plant tissue damaged by the fungus may also dry out and prevent further spread of infection, but healthy tissue is not affected at the recommended application rate. Cucurbits treated with eight applications of a 10% ciproconazol solution to eradicate a serious powdery mildew infestation, showing hardly any signs of improvement. A row of cucurbits treated once with PREV-AM at 0.4% concentration as a curative measure. Recommendation: Use PREV-AM at 0.4% concentration throughout season to effectively prevent disease outbreaks. Adding PREV-AM to a spray program can extend the useful life of insecticides and pesticides that may be susceptible to the development of resistance. PREV-AM can be a valuable addition to insect and disease management spray programs. Its unique physical mode of action makes resistance development highly unlikely. PREV-AM can either replace application(s) of a susceptible pesticide or be added as an additional application in the spray rotation. The quick knockdown of PREV-AM makes it a great addition to an IPM program. An application can be timed to control insects and diseases only when they reach the economic threshold, and because it is a contact pesticide and has no residual activity, PREV-AM applications can be made to avoid impacting beneficials. Rory Odegaard from Plant Sciences, Inc. a premier agricultural research company, talks about the benefits of using PREV-AM Ultra for insect and disease control. Plant Sciences is an agricultural research and development company focusing on plant breeding, plant tissue culture, seed production, crop growing techniques, and pest management.